AFC Fylde boss Dave Challinor believes the Proact crowd will play a big part in tomorrow’s game. 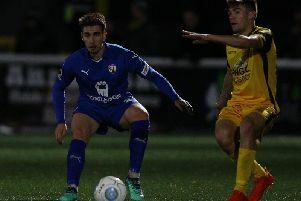 Chesterfield, winless in 11, have been booed during recent defeats by the home supporters. And Challinor, although more concerned about how Fylde play, says the mood of the Town fans could potentially play in his side’s favour. “A lot of it will depend on what the crowd are like,” he said. “I know from experience that if you’re not on a great run and you’re expected to do well, playing at home can be a difficult task. “Sometimes it can be easier playing away from home. The Fylde manager isn’t the first to relish the chance to visit the Proact, one of the better grounds in the National League. A number of opposition players and staff have been seen taking pictures of the surroundings on their arrival at the former Football League outfit. He hopes the impressive facilities will play host to an improved performance by his Coasters and a positive result. “It’s a great place to go, a fantastic stadium for this level, and ultimately we’ve got our own things to prove because we’ve got to be better than we were against Braintree,” he said.